Despite the fact that Spread Co Limited has only been in operation since 2006, it has already built a good reputation, serving the spread betting, contracts for difference, and Forex markets. Although it only claims offices in London and Singapore, there is also another office in Middlesex from which the trading takes place. The company has also established partnerships in a number of countries including Canada, India, Pakistan, Spain and the United Arab Emirates. One reason that Spread Co may be doing so well is that it is headed by Ajay Pabari who formerly was the CFO of CMC Markets but departed to setup his own company. His vision was to establish a custom-built but professional trading platform targeted to financial traders and institutions. In addition to a free demo account, Spread Co offers two types of trading account, a Standard Account and a Limited Risk Account. The Limited Risk Account is better for beginners, as it automatically limits the risk of loss. It does this by automatically placing a guaranteed stop loss order every time you place a trade. If your spread bet is successful and you close it for a profit, then the guaranteed stop loss order is automatically cancelled. If a spread bet goes the wrong way, then the guaranteed stoploss order will take you out of the trade at the trigger price, minimizing your losses. Of course, this comes at a price, and if you feel you do not need guaranteed stops it would be cheaper to spread bet using the Standard Account. Even with a Standard Account, the guaranteed stop order is still available for trades where you want to use it, or you can place an ordinary stop loss order when you take out the bet. The trading platform offered by Spread Co is called Saturn TRADER, and was developed and designed in-house. It actually comes in two versions, one an online browser version which requires no downloads, and another software version which can be downloaded and installed on your computer. This one provides a little more functionality and is thus the more versatile of the two. Both versions of the platform are free. The platform now also supports watchlists to allow clients to easily monitor markets of interest and supports the whole host of order types including ‘One cancels the other. The Saturn TRADER software itself is quite intuitive and customizable, and you can choose how you arrange the charts watchlists and data on your screen. The layout can also be saved for the next session allowing you to set up the trading screen the way you like it. They have recently launched their latest version of the trading platform and it now looks quite a bit slicker than in the past, with live news plus decent charts and hedging positions now. The platform is easy to use, and provides access to the three trading markets served, namely Forex, CFDs, and spread betting. These can all be traded from the same account. The demo account platform does seem to lag that of the live account though – there can be a delay on the demo account and spreads don’t match those of the live account so do keep this in mind when trying the platform with a simulation account. Why Spread Co? Spreads at SpreadCo are typically very competititive compared to its peers. For example, 0.8pips on EURUSD 24-hours a day, compared to 2 pips at ETX Capital. Their spread on the Dow Jones 30 is just 0.8pts in US trading hours (2.30pm – 9pm) and just 2.8pts outside of US hours. Compare that with IG Index; 2pts in US hours, 6pts between 9pm and 8am and 4pts between 8am and 2.30pm. They also offer some of the lowest financing charges out there with no charges to be short indices, equities or commodities overnight. On the downside there have been reports of occasional deal-requotes which seems to happen particularly when the market is moving fast or when stakes are high (above £50 per point). Also, a 0.80 point spread on the Dow is very tight and the problem with this is that there is a higher probability of getting re-quotes. We give Spread Co a Rating of: 4 for range of markets, margins, spread sizes and general client satisfaction. In addition to providing full training on using their platform, Spread Co offer also offer some analysis tools although I’ve found these to be rather limited but they have the essentials to allow me to implement my trading strategy so no real complaints there. For beginners there is also a comprehensive question-and-answer or FAQs section, with questions covering spread trading, opening an account, how to deposit and withdraw money, and other details to do with trading such as statements and types of order. The company is geared towards helping novices succeed, as well as providing all the facilities that the more experienced trader would expect. The company also makes available a handy forward calendar under the ‘Trading Tools’ so you can keep abreast of key figures such as the USA non-farm payroll data and Interest Rate decisions. This not only rates the importance of the economic announcement but also provides a summary of the actual released figure compared to the forecast. Mobile Trading: The company launched Android and iPhone mobile versions of its SATURN platform recently. This allows clients to open and close trades as well as place and amend stop losses and limit orders. 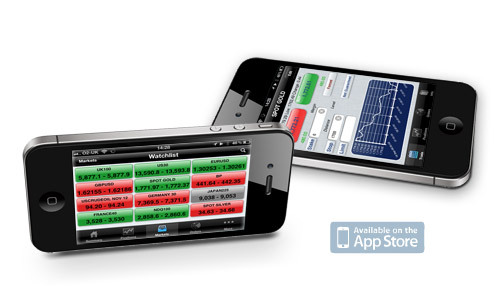 The iPhone trading app also comes with charting facilities while the account summary provides a real-time account valuation, a summary of open positions and P&L. The apps being new are still a little crude with only basic charts and no live news however this should improve in future as the company adds further functionality to the mobile platforms. Overall, we rank Spread Co as well worth a look, even though it has not been in business as long as some other brokers. 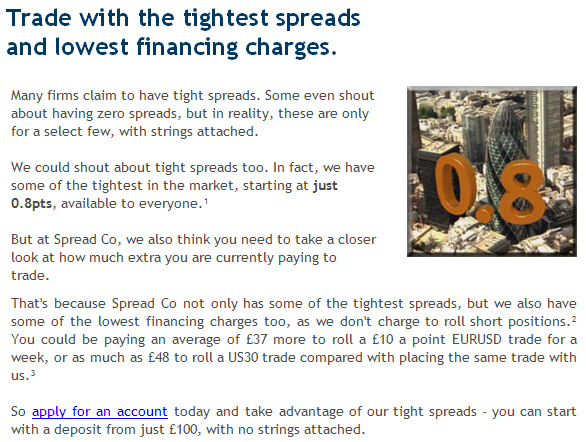 Spread Co not only has some of the tightest spreads, but also have some of the lowest financing charges too, as they don’t charge to roll short positions. It is geared to service and information, has an excellent platform, and appears to be well run. To explore further, try out the free demo account.